The French and Indian War (1754–1763) is the American name for the North American theater of the Seven Years' War. The war was fought primarily between the colonies of British America and New France, with both sides supported by military units from their parent countries of Great Britain and France, who declared war on each other in 1756. In the same year, the war escalated from a regional affair into a world-wide conflict. The name refers to the two main enemies of the British colonists: the royal French forces and the various Indigenous forces allied with them. British and European historians use the term the Seven Years' War, as do many Canadians. Canadian historians avoid the term "French and Indian War", preferring to call it the Anglo-French rivalry. The nation of Canada descends from British and French settlers as well as indigenous Aboriginal peoples. French Canadians call it La guerre de la Conquête ("The War of Conquest"). The war was fought primarily along the frontiers separating New France from the British colonies from Virginia to Nova Scotia. The French were greatly outnumbered, so they made heavy use of Indian allies. It began with a dispute over control of the confluence of the Allegheny and Monongahela rivers, called the Forks of the Ohio, and the site of the French Fort Duquesne and present-day Pittsburgh, Pennsylvania. The dispute erupted into violence in the Battle of Jumonville Glen in May 1754, during which Virginia militiamen under the command of 22-year-old George Washington ambushed a French patrol. British operations in 1755, 1756 and 1757 in the frontier areas of Pennsylvania and New York all failed, due to a combination of poor management, internal divisions, and effective Canadian, French and Indian offense. The 1755 British capture of Fort Beauséjour on the border separating Nova Scotia from Acadia was followed by its policy to the expulsion of the Acadians. Orders for the deportation were given by William Shirley, Commander-in-Chief, North America, without consent from Great Britain. The Acadians, both those captured in arms and those who had sworn the oath to His Britannic Majesty, were expelled. The Native Americans were likewise driven off their land to make way for New England settlers. After the disastrous 1757 British campaigns (resulting in a failed expedition against Louisbourg and the Siege of Fort William Henry, which was followed by Indian torture and massacres of British victims), the British government fell. William Pitt came to power and significantly increased British military resources in the colonies at a time when France was unwilling to risk large convoys to aid the limited forces it had in New France. It concentrated its forces against Prussia and its allies in the European theatre of the war. Between 1758 and 1760, the British military successfully penetrated the heartland of New France, and took control of Montreal in September 1760. The outcome was one of the most significant developments in a century of Anglo-French conflict. France ceded French Louisiana west of the Mississippi River to its ally Spain in compensation for Spain's loss to Britain of Florida (which Spain had ceded to Britain in exchange for the return of Havana, Cuba). France's colonial presence north of the Caribbean was reduced to the islands of Saint Pierre and Miquelon, confirming Britain's position as the dominant colonial power in the eastern half of North America. The conflict is known by multiple names. In British America, wars were often named after the sitting British monarch, such as King William's War or Queen Anne's War. As there had already been a King George's War in the 1740s, British colonists named the second war in King George's reign after their opponents, and it became known as the French and Indian War. This traditional name continues as the standard in the United States, although it obscures the fact that Indians fought on both sides of the conflict. American historians generally use the traditional name or sometimes the Seven Years' War. Other, less frequently used names for the war include the Fourth Intercolonial War and the Great War for the Empire. In Europe, the North American theater of the Seven Years' War usually is not given a separate name. The entire international conflict is known as the Seven Years' War. "Seven Years" refers to events in Europe, from the official declaration of war in 1756 to the signing of the peace treaty in 1763. These dates do not correspond with the fighting on mainland North America, where the fighting between the two colonial powers was largely concluded in six years, from the Battle of Jumonville Glen in 1754 to the capture of Montreal in 1760. In Canada, both French- and English-speaking Canadians refer to both the European and North American conflicts as the Seven Years' War (Guerre de Sept Ans). French Canadians may use the term "War of Conquest" (Guerre de la Conquête), since it is the war in which New France was conquered by the British and became part of the British Empire. Most English Canadians do not use that term. Map showing the 1750 possessions of Britain (pink and purple), France (blue), and Spain (orange) in contemporary Canada and the United States. 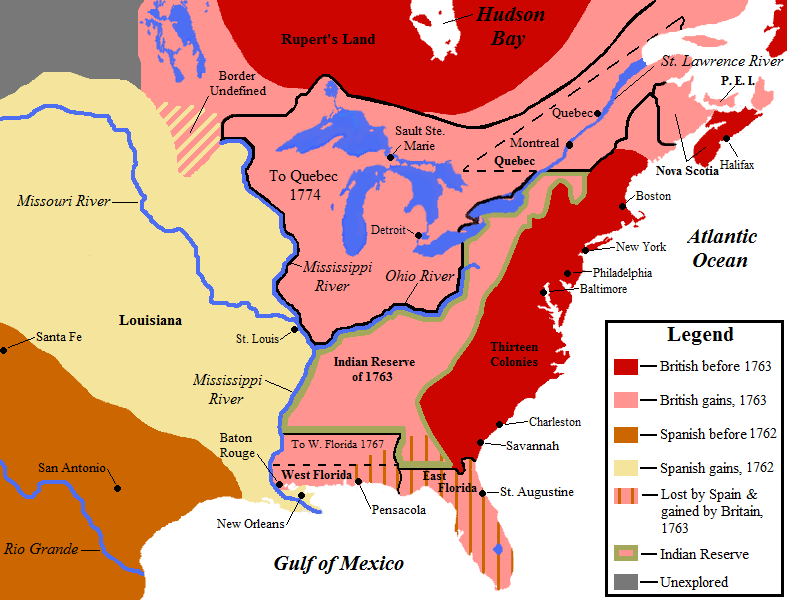 North America east of the Mississippi River was largely claimed by either Great Britain or France. The French population numbered about 75,000 and was heavily concentrated along the St. Lawrence River valley, with some also in Acadia (present-day New Brunswick and parts of Nova Scotia, including Île Royale (present-day Cape Breton Island)). Fewer lived in New Orleans and small settlements along the Mississippi River on the east side, in the Illinois Country. French fur traders and trappers traveled throughout the St. Lawrence and Mississippi watersheds, did business with local tribes, and often married Indian women. British colonies had a population of about 1.5 million and ranged along the eastern coast of the continent, from Nova Scotia and Newfoundland in the north, to Georgia in the south. Many of the older colonies had land claims that extended arbitrarily far to the west, as the extent of the continent was unknown at the time their provincial charters were granted. While their population centers were along the coast, the settlements were growing. Nova Scotia, which had been captured from France in 1713, still had a significant French-speaking population. Britain also claimed Rupert's Land, where posts of the Hudson's Bay Company traded for furs with local tribes. In between the French and the British, large areas were dominated by native tribes. To the north, the Mi'kmaq and the Abenaki were engaged in Father Le Loutre's War and still held sway in parts of Nova Scotia, Acadia, and the eastern portions of the province of Canada and present-day Maine. The Iroquois Confederation dominated much of present-day Upstate New York and the Ohio Country, although the latter also included populations of Delaware, Shawnee, and Mingo. These tribes were formally under Iroquois control, and were limited by them in authority to make agreements. Further south the interior was dominated by Catawba, Creek, Choctaw, and Cherokee tribes. When war broke out, the French used their trading connections to recruit fighters from tribes in western portions of the Great Lakes region (an area not directly subject to the conflict between the French and British), including the Huron, Mississauga, Ojibwa, Winnebago, and Potawatomi. The British were supported in the war by the Iroquois, and also by the Cherokee – until differences sparked the Anglo-Cherokee War in 1758. In 1758 the Pennsylvania government successfully negotiated the Treaty of Easton, in which a number of tribes in the Ohio Country promised neutrality in exchange for land concessions and other considerations. Most of the other northern tribes sided with the French, their primary trading partner and supplier of arms. The Creek and Cherokee were targets of diplomatic efforts by both the French and British for either support or neutrality in the conflict. It was not uncommon for small bands to participate on the "other side" of the conflict from formally-negotiated agreements. Spain's presence in eastern North America was limited to the province of Florida; it also controlled Cuba and other territories in the West Indies that became military objectives in the Seven Years' War. Florida's European population was a few hundred, concentrated in St. Augustine and Pensacola. At the start of the war, there were no French regular army troops in North America, and few British troops. New France was defended by about 3,000 troupes de la marine, companies of colonial regulars (some of whom had significant woodland combat experience), and also made calls for militia support when needed. Most British colonies mustered ill-trained militia companies to deal with native threats, but did not have any standing forces. Virginia, with a large frontier, had several companies of British regulars. The colonial governments were also used to operating independently of each other, and of the government in London, a situation that complicated negotiations with natives whose territories encompassed land claimed by multiple colonies, and, after the war began, with the British Army establishment when its leaders attempted to impose constraints and demands on the colonial administrations. In June 1747, concerned about the incursion and expanding influence of British traders such as George Croghan in the Ohio Country, Roland-Michel Barrin de La Galissonière, the Governor-General of New France, ordered Pierre-Joseph Céloron to lead a military expedition through the area. 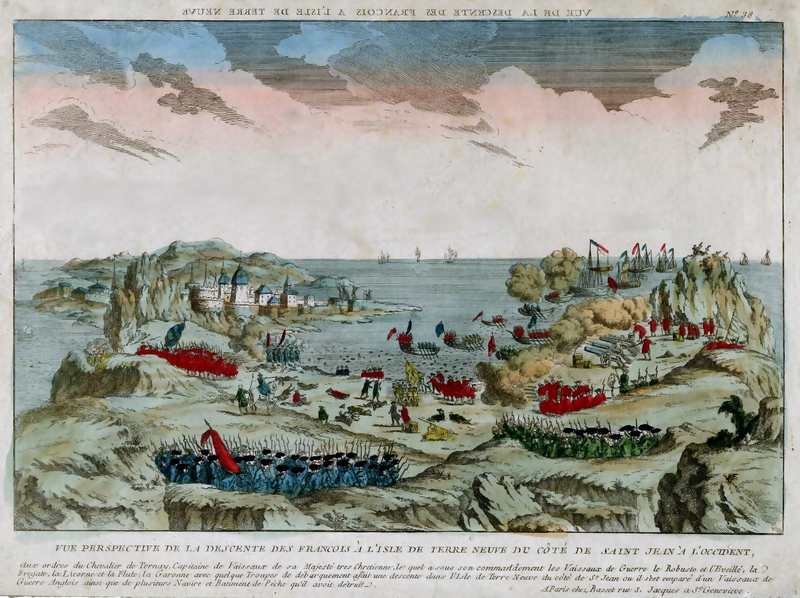 Its objectives were to confirm the original French claim to the territory, determine the level of British influence, and impress the Indians with a French show of force. Céloron's expedition force consisted of about 200 Troupes de la marine and 30 Indians. The expedition covered about 3,000 miles (4,800 km) between June and November 1749. It went up the St. Lawrence, continued along the northern shore of Lake Ontario, crossed the portage at Niagara, and then followed the southern shore of Lake Erie. At the Chautauqua Portage (near present-day Barcelona, New York), the expedition moved inland to the Allegheny River, which it followed to the site of present-day Pittsburgh. There Céloron buried lead plates engraved with the French claim to the Ohio Country. Whenever he encountered British merchants or fur-traders, Céloron informed them of the French claims on the territory and told them to leave. When Céloron's expedition arrived at Logstown, the Native Americans in the area informed Céloron that they owned the Ohio Country and that they would trade with the British regardless of the French. Céloron continued south until his expedition reached the confluence of the Ohio and the $3 rivers, which lay just south of the village of Pickawillany, the home of the Miami chief known as "Old Briton". Céloron threatened "Old Briton" of severe consequences if he continued to trade with the British. "Old Briton" ignored the warning. Disappointed, Céloron returned to Montreal in November 1749. In his extensively detailed report, Céloron wrote, "All I can say is that the Natives of these localities are very badly disposed towards the French, and are entirely devoted to the English. I don't know in what way they could be brought back." Even before his return to Montreal, reports on the situation in the Ohio Country were making their way to London and Paris, proposing that action be taken. William Shirley, the expansionist governor of the Province of Massachusetts Bay, was particularly forceful, stating that British colonists would not be safe as long as the French were present. In 1749 the British government gave land to the Ohio Company of Virginia for the purpose of developing trade and settlements in the Ohio Country. The grant required that it settle 100 families in the territory, and construct a fort for their protection. But, as the territory was also claimed by Pennsylvania, both colonies began pushing for action to improve their respective claims. In 1750 Christopher Gist, acting on behalf of both Virginia and the company, explored the Ohio territory and opened negotiations with the Indian tribes at Logstown. He completed the 1752 Treaty of Logstown, in which the local Indians, through their "Half-King" Tanacharison and an Iroquois representative, agreed to terms that included permission to build a "strong house" at the mouth of the Monongahela River (the site of present-day Pittsburgh, Pennsylvania). The War of the Austrian Succession (whose North American theater is known as King George's War) formally ended in 1748 with the signing of the Treaty of Aix-la-Chapelle. The treaty was primarily focused on resolving issues in Europe. The issues of conflicting territorial claims between British and French colonies in North America were turned over to a commission to resolve, but it reached no decision. Frontiers from between Nova Scotia and Acadia in the north, to the Ohio Country in the south, were claimed by both sides. The disputes also extended into the Atlantic Ocean, where both powers wanted access to the rich fisheries of the Grand Banks off Newfoundland. On March 17, 1752, the Governor-General of New France, Marquis de la Jonquière, died and was temporarily replaced by Charles le Moyne de Longueuil. His permanent replacement, the Marquis Duquesne, did not arrive in New France until 1752 to take over the post. The continuing British activity in the Ohio territories prompted Longueuil to dispatch another expedition to the area under the command of Charles Michel de Langlade, an officer in the Troupes de la Marine. Langlade was given 300 men, including French-Canadians and warriors of the Ottawa. His objective was to punish the Miami people of Pickawillany for not following Céloron's orders to cease trading with the British. On June 21, the French war party attacked the trading centre at Pickawillany, capturing three traders and killing 14 people of the Miami nation, including Old Briton. He was reportedly ritually cannibalized by some aboriginal members of the expedition. In the spring of 1753, Paul Marin de la Malgue was given command of a 2,000-man force of Troupes de la Marine and Indians. His orders were to protect the King's land in the Ohio Valley from the British. Marin followed the route that Céloron had mapped out four years earlier, but where Céloron had limited the record of French claims to the burial of lead plates, Marin constructed and garrisoned forts. He first constructed Fort Presque Isle (near present-day Erie, Pennsylvania) on Lake Erie's south shore. He had a road built to the headwaters of LeBoeuf Creek. Marin constructed a second fort at Fort Le Boeuf (present-day Waterford, Pennsylvania), designed to guard the headwaters of LeBoeuf Creek. As he moved south, he drove off or captured British traders, alarming both the British and the Iroquois. Tanaghrisson, a chief of the Mingo, who were remnants of Iroquois and other tribes who had been driven west by colonial expansion. He intensely disliked the French (whom he accused of killing and eating his father). Traveling to Fort Le Boeuf, he threatened the French with military action, which Marin contemptuously dismissed. The Iroquois sent runners to William Johnson's manor in upstate New York. Johnson, known to the Iroquois as Warraghiggey, meaning "He who does great things", had become a respected honorary member of the Iroquois Confederacy in the area. In 1746, Johnson was made a colonel of the Iroquois. Later he was commissioned as a colonel of the Western New York Militia. They met at Albany, New York with Governor Clinton and officials from some of the other American colonies. Chief Hendrick insisted that the British abide by their obligations and block French expansion. When Clinton did not respond to his satisfaction, Chief Hendrick said that the "Covenant Chain", a long-standing friendly relationship between the Iroquois Confederacy and the British Crown, was broken. Governor Robert Dinwiddie of Virginia was an investor in the Ohio Company, which stood to lose money if the French held their claim. To counter the French military presence in Ohio, in October 1753 Dinwiddie ordered the 21-year-old Major George Washington (whose brother was another Ohio Company investor) of the Virginia Regiment to warn the French to leave Virginia territory. Washington left with a small party, picking up along the way Jacob Van Braam as an interpreter; Christopher Gist, a company surveyor working in the area; and a few Mingo led by Tanaghrisson. On December 12, Washington and his men reached Fort Le Boeuf. Jacques Legardeur de Saint-Pierre, who succeeded Marin as commander of the French forces after the latter died on October 29, invited Washington to dine with him at his arrival. Over dinner, Washington presented Saint-Pierre with the letter from Dinwiddie demanding an immediate French withdrawal from the Ohio Country. Saint-Pierre said, "As to the Summons you send me to retire, I do not think myself obliged to obey it." He told Washington that France's claim to the region was superior to that of the British, since René-Robert Cavelier, Sieur de La Salle had explored the Ohio Country nearly a century earlier. Washington's map of the Ohio River and surrounding region containing notes on French intentions, 1753 or 1754. Leaving Fort Le Boeuf early on December 16, Washington and his party arrived in Williamsburg on January 16, 1754. 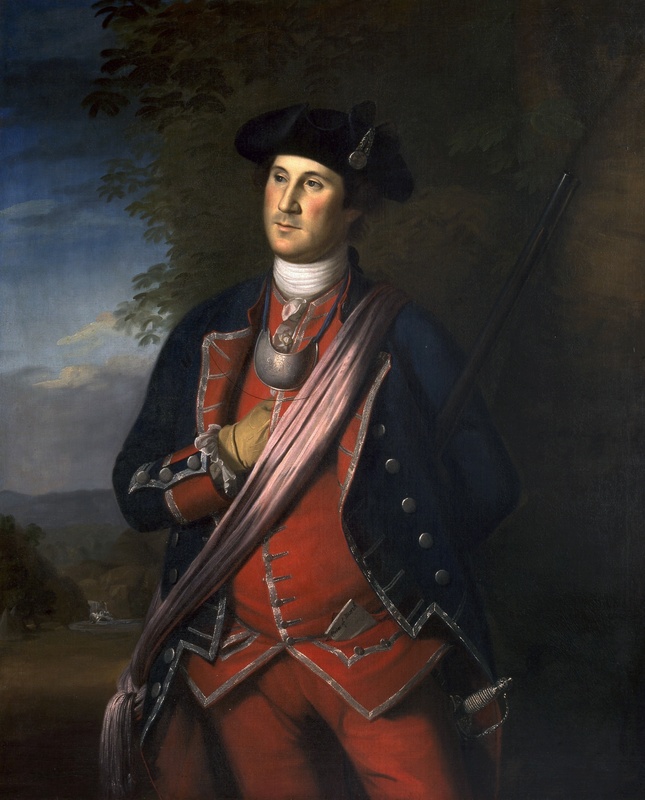 In his report, Washington stated, "The French had swept south", detailing the steps they had taken to fortify the area, and their intention to fortify the confluence of the Allegheny and Monongahela rivers. Even before Washington returned, Dinwiddie had sent a company of 40 men under William Trent to that point, where in the early months of 1754 they began construction of a small stockaded fort. Governor Duquesne sent additional French forces under Claude-Pierre Pecaudy de Contrecœur to relieve Saint-Pierre during the same period, and Contrecœur led 500 men south from Fort Venango on April 5, 1754. When these forces arrived at the fort on April 16, Contrecœur generously allowed Trent's small company to withdraw. He purchased their construction tools to continue building what became Fort Duquesne. After Washington had returned to Williamsburg, Dinwiddie ordered him to lead a larger force to assist Trent in his work. While en route, he learned of Trent's retreat. Since Tanaghrisson had promised the British support, Washington continued toward Fort Duquesne and met with the Mingo leader. Learning of a French scouting party in the area, Washington, with Tanaghrisson and his party, surprised the Canadians on May 28. They killed many of the Canadians, including their commanding officer, Joseph Coulon de Jumonville, whose head was reportedly split open by Tanaghrisson with a tomahawk. The historian Fred Anderson suggests that Tanaghrisson was acting to gain the support of the British and regain authority over his own people. They had been more inclined to support the French, with whom they had long trading relationships. One of Tanaghrisson's men told Contrecoeur that Jumonville had been killed by British musket fire. Historians generally consider the Battle of Jumonville Glen as the opening battle of the French and Indian War in North America and the start of hostilities in the Ohio valley. The earliest authenticated portrait of George Washington shows him wearing his colonel's uniform of the Virginia Regiment. This portrait was painted in 1772 by Charles Willson Peale. Following the battle, Washington pulled back several miles and established Fort Necessity, which the French attacked on July 3. Washington surrendered; he negotiated a withdrawal under arms. One of Washington's men reported that the French force was accompanied by Shawnee, Delaware, and Mingo native warriors—just those whom Tanaghrisson was seeking to influence. News of the two battles reached England in August, and, after several months of negotiations, the government of the Duke of Newcastle decided to send an army expedition the following year to dislodge the French. They chose Major General Edward Braddock to lead the expedition. Word of the British military plans leaked to France well before Braddock's departure for North America. In response, King Louis XV dispatched six regiments to New France under the command of Baron Dieskau in 1755. The British, intending to blockade French ports, sent out their fleet in February 1755, but the French fleet had already sailed. Admiral Edward Hawke detached a fast squadron to North America in an attempt to intercept the French. In a second British action, Admiral Edward Boscawen fired on the French ship Alcide on June 8, 1755, capturing her and two troop ships. The British harassed French shipping throughout 1755, seizing ships and capturing seamen, contributing to the eventual formal declarations of war in spring 1756. Locations of British campaigns, 1755 (and other sites). The British formed an aggressive plan of operations for 1755. General Braddock was to lead the expedition to Fort Duquesne. While the Massachusetts provincial governor William Shirley was given the task of fortifying Fort Oswego and attacking Fort Niagara, Sir William Johnson was to capture Fort St. Frédéric (at present-day Crown Point, New York), and Lieutenant Colonel Robert Monckton was to capture Fort Beauséjour on the frontier between Nova Scotia and Acadia. Braddock (with George Washington as one of his aides) led about 1,500 army troops and provincial militia on an expedition in June 1755 to take Fort Duquesne. The expedition was a disaster. It was attacked by French and Indian soldiers ambushing them from up in trees and behind logs. Braddock called for a retreat. He was killed. Approximately 1,000 British soldiers were killed or injured. The remaining 500 British troops, led by George Washington, retreated to Virginia. Two future opponents in the American Revolutionary War, Washington and Thomas Gage, played key roles in organizing the retreat. The French acquired a copy of the British war plans, including the activities of Shirley and Johnson. Shirley's efforts to fortify Oswego were bogged down in logistical difficulties and magnified by Shirley's inexperience in managing large expeditions. When it was clear he would not have time to mount an expedition across Lake Ontario to Fort Ontario, Shirley left garrisons at Oswego, Fort Bull, and Fort Williams (the latter two located on the Oneida Carry between the Mohawk River and Wood Creek at present-day Rome, New York). Supplies for use in the projected attack on Niagara were cached at Fort Bull. Johnson's expedition was better organized than Shirley's, which was noticed by New France's governor, the Marquis de Vaudreuil. He had primarily been concerned about the extended supply line to the forts on the Ohio, and had sent Baron Dieskau to lead the defenses at Frontenac against Shirley's expected attack. When Johnson was seen as the larger threat, Vaudreuil sent Dieskau to Fort St. Frédéric to meet that threat. Dieskau planned to attack the British encampment at Fort Edward at the upper end of navigation on the Hudson River, but Johnson had strongly fortified it, and Dieskau's Indian support was reluctant to attack. The two forces finally met in the bloody Battle of Lake George between Fort Edward and Fort William Henry. The battle ended inconclusively, with both sides withdrawing from the field. Johnson's advance stopped at Fort William Henry, and the French withdrew to Ticonderoga point, where they began the construction of Fort Carillon (later renamed Fort Ticonderoga after British capture in 1759). Colonel Monckton, in the sole British success that year, captured Fort Beauséjour in June 1755, cutting the French fortress at Louisbourg off from land-based reinforcements. To cut vital supplies to Louisbourg, Nova Scotia's Governor Charles Lawrence ordered the deportation of the French-speaking Acadian population from the area. Monckton's forces, including companies of Rogers' Rangers, forcibly removed thousands of Acadians, chasing down many who resisted, and sometimes committing atrocities. More than any other factor, the cutting off of supplies to Louisbourg led to its demise. The Acadian resistance, in concert with native allies, including the Mi'kmaq, was sometimes quite stiff, with ongoing frontier raids (against Dartmouth and Lunenburg among others). Other than the campaigns to expel the Acadians (ranging around the Bay of Fundy, on the Petitcodiac and St. John rivers, and Île Saint-Jean), the only clashes of any size were at Petitcodiac in 1755 and at Bloody Creek near Annapolis Royal in 1757. Following the death of Braddock, William Shirley assumed command of British forces in North America. At a meeting in Albany in December 1755, he laid out his plans for 1756. In addition to renewing the efforts to capture Niagara, Crown Point and Duquesne, he proposed attacks on Fort Frontenac on the north shore of Lake Ontario and an expedition through the wilderness of the Maine district and down the Chaudière River to attack the city of Quebec. Bogged down by disagreements and disputes with others, including William Johnson and New York's Governor Sir Charles Hardy, Shirley's plan had little support. Newcastle replaced him in January 1756 with Lord Loudoun, with Major General James Abercrombie as his second in command. Neither of these men had as much campaign experience as the trio of officers France sent to North America. French regular army reinforcements arrived in New France in May 1756, led by Major General Louis-Joseph de Montcalm and seconded by the Chevalier de Lévis and Colonel François-Charles de Bourlamaque, all experienced veterans from the War of the Austrian Succession. During that time in Europe, on May 18, 1756, England formally declared war on France, which expanded the war into Europe, which was later to be known as the Seven Years' War. Governor Vaudreuil, who harboured ambitions to become the French commander in chief (in addition to his role as governor), acted during the winter of 1756 before those reinforcements arrived. Scouts had reported the weakness of the British supply chain, so he ordered an attack against the forts Shirley had erected at the Oneida Carry. In the March Battle of Fort Bull, French forces destroyed the fort and large quantities of supplies, including 45,000 pounds of gunpowder. They set back any British hopes for campaigns on Lake Ontario, and endangered the Oswego garrison, already short on supplies. French forces in the Ohio valley also continued to intrigue with Indians throughout the area, encouraging them to raid frontier settlements. This led to ongoing alarms along the western frontiers, with streams of refugees returning east to get away from the action. The new British command was not in place until July. When he arrived in Albany, Abercrombie refused to take any significant actions until Loudoun approved them. Montcalm took bold action against his inertia. Building on Vaudreuil's work harassing the Oswego garrison, Montcalm executed a strategic feint by moving his headquarters to Ticonderoga, as if to presage another attack along Lake George. With Abercrombie pinned down at Albany, Montcalm slipped away and led the successful attack on Oswego in August. In the aftermath, Montcalm and the Indians under his command disagreed about the disposition of prisoners' personal effects. The Europeans did not consider them prizes and prevented the Indians from stripping the prisoners of their valuables, which angered the Indians. Loudoun, a capable administrator but a cautious field commander, planned one major operation for 1757: an attack on New France's capital, Quebec. Leaving a sizable force at Fort William Henry to distract Montcalm, he began organizing for the expedition to Quebec. He was then ordered by William Pitt, the Secretary of State responsible for the colonies, to attack Louisbourg first. Beset by delays of all kinds, the expedition was finally ready to sail from Halifax, Nova Scotia in early August. In the meantime French ships had escaped the British blockade of the French coast, and a fleet outnumbering the British one awaited Loudoun at Louisbourg. Faced with this strength, Loudoun returned to New York amid news that a massacre had occurred at Fort William Henry. French irregular forces (Canadian scouts and Indians) harassed Fort William Henry throughout the first half of 1757. In January they ambushed British rangers near Ticonderoga. In February they launched a daring raid against the position across the frozen Lake George, destroying storehouses and buildings outside the main fortification. In early August, Montcalm and 7,000 troops besieged the fort, which capitulated with an agreement to withdraw under parole. When the withdrawal began, some of Montcalm's Indian allies, angered at the lost opportunity for loot, attacked the British column, killing and capturing several hundred men, women, children, and slaves. The aftermath of the siege may have contributed to the transmission of smallpox into remote Indian populations; as some Indians were reported to have traveled from beyond the Mississippi to participate in the campaign and returned afterward having been exposed to European carriers. The Victory of Montcalm's Troops at Carillon by Henry Alexander Ogden. Vaudreuil and Montcalm were minimally resupplied in 1758, as the British blockade of the French coastline limited French shipping. The situation in New France was further exacerbated by a poor harvest in 1757, a difficult winter, and the allegedly corrupt machinations of François Bigot, the intendant of the territory. His schemes to supply the colony inflated prices and were believed by Montcalm to line his pockets and those of his associates. 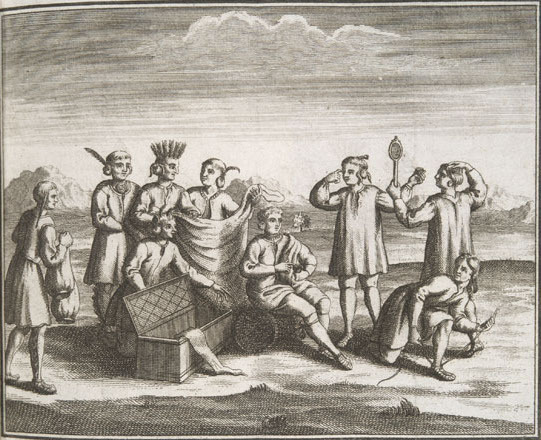 A massive outbreak of smallpox among western tribes led many of them to stay away from trading in 1758. While many parties to the conflict blamed others (the Indians blamed the French for bringing "bad medicine" as well as denying them prizes at Fort William Henry), the disease was probably spread through the crowded conditions at William Henry after the battle. Montcalm focused his meager resources on the defense of the St. Lawrence, with primary defenses at Carillon, Quebec, and Louisbourg, while Vaudreuil argued unsuccessfully for a continuation of the raiding tactics that had worked quite effectively in previous years. The British failures in North America, combined with other failures in the European theater, led to the fall from power of Newcastle and his principal military advisor, the Duke of Cumberland. Newcastle and Pitt joined in an uneasy coalition in which Pitt dominated the military planning. He embarked on a plan for the 1758 campaign that was largely developed by Loudoun. He had been replaced by Abercrombie as commander in chief after the failures of 1757. Pitt's plan called for three major offensive actions involving large numbers of regular troops, supported by the provincial militias, aimed at capturing the heartlands of New France. Two of the expeditions were successful, with Fort Duquesne and Louisbourg falling to sizable British forces. The Forbes Expedition was a British campaign in September–October 1758, with 6,000 troops led by General John Forbes to drive the French out of the contested Ohio Country. After a British advance party on Fort Duquesne was repulsed on September 14, the French withdrew from Fort Duquesne, leaving the British in control of the Ohio River Valley. The great French fortress at Louisbourg in Nova Scotia was captured after a siege. The third invasion was stopped with the improbable French victory in the Battle of Carillon, in which 3,600 Frenchmen famously and decisively defeated Abercrombie's force of 18,000 regulars, militia and Native American allies outside the fort the French called Carillon and the British called Ticonderoga. Abercrombie saved something from the disaster when he sent John Bradstreet on an expedition that successfully destroyed Fort Frontenac, including caches of supplies destined for New France's western forts and furs destined for Europe. Abercrombie was recalled and replaced by Jeffery Amherst, victor at Louisbourg. In the aftermath of generally poor French results in most theaters of the Seven Years' War in 1758, France's new foreign minister, the duc de Choiseul, decided to focus on an invasion of Britain, to draw British resources away from North America and the European mainland. The invasion failed both militarily and politically, as Pitt again planned significant campaigns against New France, and sent funds to Britain's ally on the mainland, Prussia, and the French Navy failed in the 1759 naval battles at Lagos and Quiberon Bay. In one piece of good fortune, some French supply ships managed to depart France, eluding the British blockade of the French coast. British victories continued in all theaters in the Annus Mirabilis of 1759, when they finally captured Ticonderoga, James Wolfe defeated Montcalm at Quebec (in a battle that claimed the lives of both commanders), and victory at Fort Niagara successfully cut off the French frontier forts further to the west and south. The victory was made complete in 1760, when, despite losing outside Quebec City in the Battle of Sainte-Foy, the British were able to prevent the arrival of French relief ships in the naval Battle of the Restigouche while armies marched on Montreal from three sides. 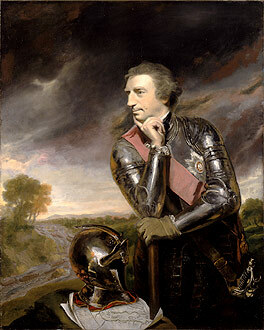 In September 1760, Governor Vaudreuil negotiated a surrender with General Amherst. Amherst granted Vaudreuil's request that any French residents who chose to remain in the colony would be given freedom to continue worshiping in their Roman Catholic tradition, continued ownership of their property, and the right to remain undisturbed in their homes. The British provided medical treatment for the sick and wounded French soldiers and French regular troops were returned to France aboard British ships with an agreement that they were not to serve again in the present war. Most of the fighting between France and Britain in continental North America ended in 1760, while the fighting in Europe continued. The notable exception was the French seizure of St. John's, Newfoundland. When General Amherst heard of this surprise action, he immediately dispatched troops under his nephew William Amherst, who regained control of Newfoundland after the Battle of Signal Hill in September 1762. Many troops from North America were reassigned to participate in further British actions in the West Indies, including the capture of Spanish Havana when Spain belatedly entered the conflict on the side of France, and a British expedition against French Martinique in 1762. General Amherst also oversaw the transition of French forts in the western lands to British control. The policies he introduced in those lands disturbed large numbers of Indians, and contributed to the outbreak in 1763 of the conflict known as Pontiac's Rebellion. This series of attacks on frontier forts and settlements required the continued deployment of British troops, and was not resolved until 1766. The war in North America officially ended with the signing of the Treaty of Paris on February 10, 1763, and war in the European theatre of the Seven Years' War was settled by the Treaty of Hubertusburg on February 15, 1763. The British offered France the choice of surrendering either its continental North American possessions east of the Mississippi or the Caribbean islands of Guadeloupe and Martinique, which had been occupied by the British. France chose to cede the former, but was able to negotiate the retention of Saint Pierre and Miquelon, two small islands in the Gulf of St. Lawrence, along with fishing rights in the area. They viewed the economic value of the Caribbean islands' sugar cane to be greater and easier to defend than the furs from the continent. The British, for their part, were happy to take New France, as defense was not an issue and as they already had ample places from which to obtain sugar. Spain, which traded Florida to Britain to regain Cuba, also gained Louisiana, including New Orleans, from France in compensation for its losses. Great Britain and Spain also agreed that navigation on the Mississippi River was to be open to vessels of all nations. The war changed economic, political, governmental and social relations between three European powers (Britain, France, and Spain), their colonies and colonists, and the natives that inhabited the territories they claimed. France and Britain both suffered financially because of the war, with significant long-term consequences. Map showing British territorial gains following the Treaty of Paris in pink, and Spanish territorial gains after the Treaty of Fontainebleau in yellow. Following the treaty, King George III issued the Royal Proclamation of 1763 on October 7, 1763, which outlined the division and administration of the newly conquered territory, and to some extent continues to govern relations between the government of modern Canada and the First Nations. Included in its provisions was the reservation of lands west of the Appalachian Mountains to its Indian population, a demarcation that was at best a temporary impediment to a rising tide of westward-bound settlers. 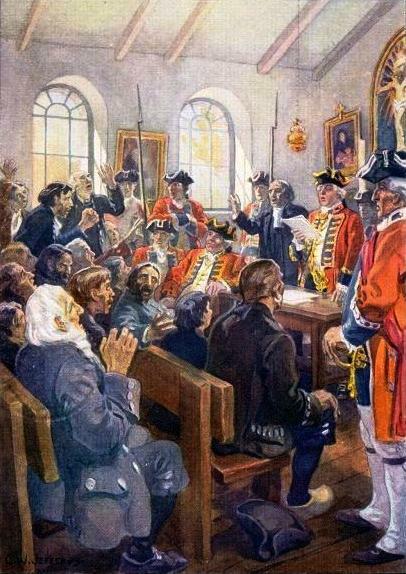 The proclamation also contained provisions that prevented civic participation by the Roman Catholic Canadians. When accommodations were made in the Quebec Act in 1774 to address this and other issues, religious concerns were raised in the largely Protestant Thirteen Colonies over the advance of "popery". The Seven Years' War nearly doubled Britain's national debt. The Crown, seeking sources of revenue to pay off the debt, attempted to impose new taxes on its colonies. These attempts were met with increasingly stiff resistance, until troops were called in so that representatives of the Crown could safely perform their duties. These acts ultimately led to the start of the American Revolutionary War. France attached comparatively little value to its North American possessions, especially in respect to the highly profitable sugar-producing Antilles islands, which it managed to retain. Minister Choiseul considered he had made a good deal at the Treaty of Paris, and philosopher Voltaire wrote that Louis XV had lost "a few acres of snow". For France however, the military defeat and the financial burden of the war weakened the monarchy and contributed to the advent of the French Revolution in 1789. For many native populations, the elimination of French power in North America meant the disappearance of a strong ally and counterweight to British expansion, leading to their ultimate dispossession. The Ohio Country was particularly vulnerable to legal and illegal settlement due to the construction of military roads to the area by Braddock and Forbes. 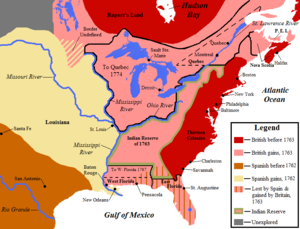 Although the Spanish takeover of the Louisiana territory (which was not completed until 1769) had modest repercussions, the British takeover of Spanish Florida resulted in the westward migration of tribes that did not want to do business with the British, and a rise in tensions between the Choctaw and the Creek, historic enemies whose divisions the British at times exploited. The change of control in Florida also prompted most of its Spanish Catholic population to leave. Most went to Cuba, including the entire governmental records from St. Augustine, although some Christianized Yamasee were resettled to the coast of Mexico. 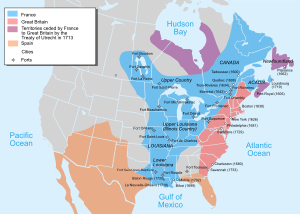 France returned to North America in 1778 with the establishment of a Franco-American alliance against Great Britain in the American War of Independence. This time France succeeded in prevailing over Great Britain, in what historian Alfred Cave describes as "French [...] revenge for Montcalm's death". ↑ 7.0 7.1 7.2 Anderson (2000), p. 747. ↑ The Canadian Encyclopedia: Seven Years' War. ↑ (French) L'Encyclopédie canadienne: Guerre de Sept Ans. ↑ Powell, John (2005). Encyclopedia of North American immigration. New York: Facts on File. p. 204. ISBN 0816046581. ↑ Cogliano, Francis D. (2008). Revolutionary America, 1763–1815: A Political History. London: Routledge. p. 32. ISBN 9780415964869. ↑ 16.0 16.1 16.2 Anderson (2000), p. 26. ↑ 17.0 17.1 Fowler, p. 14. ↑ Ellis, His Excellency George Washington, p. 5. ↑ Anderson (2000), pp. 51–59. ↑ Anderson (2000), pp. 59–65. ↑ 44.0 44.1 Fowler, p. 98. ↑ 45.0 45.1 "The Battle of the Monongahela". 1755. http://www.wdl.org/en/item/9580/. Retrieved 2013-08-03. ↑ Patterson, Stephen E. (1994). "1744-1763: Colonial Wars and Aboriginal Peoples". In Buckner, Phillip; Reid, John. The Atlantic Region to Confederation: A History. Toronto: University of Toronto Press. p. 152. ISBN 0802005535. ↑ Anderson, Fred (2000). Crucible of War: The Seven Years' War and the Fate of Empire in British North America, 1754–1766. New York: Alfred A. Knopf. pp. 267–285. ISBN 0375406425. ↑ Anderson, Fred. "The Real First World War and the Making of America" American Heritage, November/December 2005. "Virtual Vault". Library and Archives Canada. http://www.collectionscanada.ca/virtual-vault/.